In the 1930s, one narrow East End street, Cable Street, became the location for one of the most famous anti-fascist clashes in England’s history. On the day, local residents fought against the fascist and anti-Semitic principles of Sir Oswald Mosley and his Blackshirt followers. The Battle of Cable Street has become a celebrated anti-fascist event. Oswald Mosley was a politician who switched across the Conservative and Labour parties before setting up the British Union of Fascists in 1932. Closely aligned to the political principles of Hitler, Mosley was supported by members known as Blackshirts because of the black uniforms they wore. He targeted the East End of London because it had a large Jewish population. According to Mosley and his party, England could blame the Jews for all of its problems. In 1936, he announced that he and his Blackshirts were planning a major march through the East End on October 4th. Despite attempts to ban the march, it went ahead, much to the disgust of local residents and other political parties who decided to take a stand. Although Mosley may have expected to meet some organised resistance from the local population and even though Jewish leaders had advised their people to stay out of the fight, he might not have anticipated the number of people who turned out to stop the march. It is thought that hundreds of thousands of people led by Phil Piration, the leader of the Communist Party of Great Britain, were in the East End on the morning of the march, ready to defend it against the Blackshirts from various locations around the planned route. These anti-fascist groups decided to try to stop the march by building roadblocks in key areas. The main barricades were located on Cable Street, near Christian Street. Despite a strong police presence of around 6,000 men, the largest force ever seen in the area, locals made it virtually impossible for them to clear the way for Mosley’s march to continue down the street. The phrase “They Shall Not Pass” became synonymous with the demonstrators efforts to put a stop to the fascists. The barricade at Cable Street was based around an overturned lorry that effectively blocked access through the narrow street. This was then reinforced with barrels, wood, bricks, paving stones and corrugated iron to make it larger and more secure. The advancing police could not get close enough to the barricade to bring it down as they were pelted with bricks and other objects by the men standing behind it. The police had to eventually send out for reinforcements and it took a full baton charge to eventually clear the street so that the barricade could be dismantled. Although Mosley’s march did not actually make it this far, demonstrators fought with police who were trying to remove the barricades, using any weapons they could lay their hands on, including sticks, rocks and even chair legs. Some even kidnapped police officers to prevent them from doing their job. Even the local women played a part, pelting police from their houses with eggs, rotten vegetables, rubbish, milk bottles and the contents of their chamber pots. The progress of police horses was disrupted by marbles rolled from local houses and glass scattered into the streets. Eventually Mosley was ordered to call a halt to the march to avoid any further disruption or bloodshed and his Blackshirts diverted their route to Hyde Park outside of the East End. It is thought that around 170 people were injured in the skirmishes and 150 were arrested. Some of those arrested said that the police treated them badly; most got away with minor fines, however leaders of the demonstrators who were caught had to serve three months of hard labour. The Battle of Cable Street changed the way that the country manages demonstrations. For example, it made a significant contribution to the 1936 Public Order Act as lessons were learned from what had happened. From this point, political marches could only happen with the consent of the police and it became illegal to wear political uniforms in public. Mosley and his British Union of Fascists never really again gained a foothold in British politics, or widespread popularity. By 1940, the government banned the party and Mosley ended up interned in a house at Holloway Prison for the next few years. If you visit the Cable Street area, make sure to visit the St George’s Town Hall building on the street. There is a famous mural depicting the Battle of Cable Street on the side wall of the building. You can also see a red plaque commemorating the day on a building where Cable Street meets Dock Street. 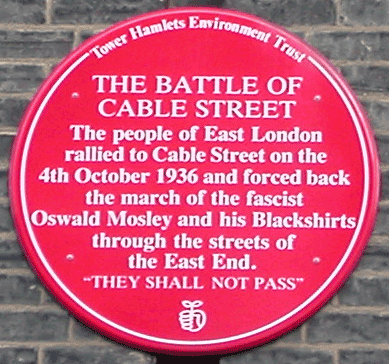 Does anyone know of a group or individual that commemorates the 1936 protests against Mosely in Cable Street. Would anyone be interested leading such a remembrance?